Ever since Take Shelter, I’ve been zeroed in on Michael Shannon. I know he was around long before that, but his filmography is a mixed bag and doesn’t include many star roles: Groundhog Day, Pearl Harbor, Vanilla Sky, 8 Mile, Kangaroo Jack, Jonah Hex. 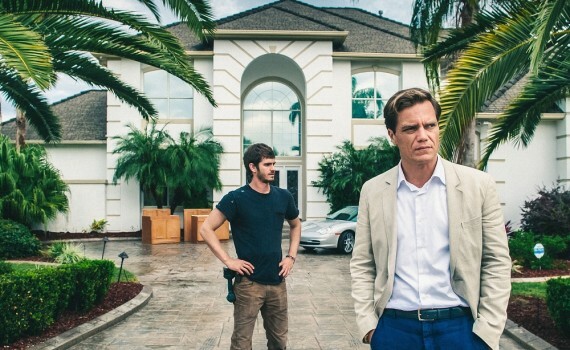 It wasn’t until Take Shelter that his career really took off, and look at the movies he’s done since: Mud, Man of Steel, Young Ones, and now 99 Homes. He’s on some sort of roll, and it’s completely justified. Shannon is a ball of raw talent who’s only getting better; not bad for a 40-something guy from Kentucky. He has an intensity about him that he can use to create a villain or a flawed hero, and, what’s more, he’s incredibly believable no many which way he takes it. I focus on Shannon because he’s the best part of this film, a movie that otherwise would only be OK, a poignant reminder of a terrible time but not the best picture you’ll see this year. After the American economy tanked in the early 2000s, there were two groups of people who emerged: those who lost everything & those who took it. Dennis Nash was a victim of questionable lending practices, poor judgement, and a national economic collapse that he couldn’t control. It all culminated in the loss of his job and his family home, where he lived with his mother & his son. Homeowners might be losing everything, but the banks are too big to fail, so the money all heads their way, though some of it sticks to the fingers of men like Rick Carver, a realtor who knows the eviction business better than anyone else. He’s making a fortune, skimming off the top, and ruining lives left & right, mostly legally, though a few shady schemes fly under the radar. Nash is now desperate for a job, and somehow finds himself working for Carver, serving the same notices he received so recently, making money off the mistakes of others, metamorphosing into the vulture capitalist he despises so much. The best part of the film was definitely Michael Shannon, but both the message behind the movie and Andrew Garfield’s character were both strong points as well. Shannon is, very simply, good enough to dominate a film. He steals every scene, and that face stays in your brain long after the plot has moved on. He’s compelling and talented, a combination that hits you hard and refuses to dissipate. Garfield wasn’t bad himself as the depressed yet hard-working everyman, pulling off the part well enough to become a representation of the trouble of the times. And it’s a fascinating story, something most of us lived through & can remember, a recession unlike anything we had ever seen. Now, it wasn’t The Crash, people weren’t leaping out of windows, and it doesn’t make for the most interesting film of all time. But this is a little story about a bad time, something we can all relate to, and acted out well enough to be elevated.